The May holiday period starts on Friday 22 April. Many holidaymakers have chosen to travel via Amsterdam Airport Schiphol. The airport will be deploying extra staff at this busy time. Passengers are also asked to prepare well for their trip. Schiphol advises passengers to arrive at the airport on time, keeping to the time specified by the airline. How long before your flight should you arrive at Schiphol? 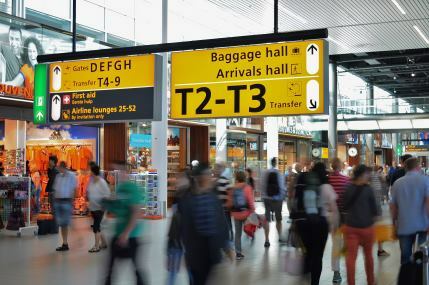 In recent weeks, the media have suggested that passengers should arrive at Schiphol much earlier than usual because of the busy May holiday period. However, there is no point doing in so as the check-in desks will not yet be open at that time. Schiphol advises passengers to keep to the time specified by the airline. Current flight information can be found at our website (departure times) or on the websites of the relevant airlines. Schiphol is giving passengers tips on how to prepare properly for their journey. This will help the check-in, security and Passport Control processes run more smoothly. Check well before departure whether your passport or ID card is valid. Know what is allowed in your hand baggage. Arrive on time, keeping to the time specified by the airline. Check in online at home or at one of the self-service check-in points at the airport. Keep travel documents, electronic devices and packaged liquids within easy reach. Strict rules apply to the contents of your hand baggage. In addition, special conditions apply to the packaging of liquids and gels.